The last thing you want is to be cruising around on our sunny Southern California streets, only have your pleasant day-drive come to a screeching halt. That’s why proper Porsche maintenance and service are key to getting the most out of your driving experience – after all, Porsches are high-performance vehicles that warrant careful attention to maintenance and routine service. Fortunately, your independent Porsche mechanic professionals in Pasadena at HOUSE Automotive are here to briefly identify some common issues that Porsche owners face. As always, feel free to learn more about our independent Porsche specialists, or get in touch with our friendly team today to learn more about what we can do for you. Step aside Volkswagen, because CELs also frequently pop up on most Porsches (of course, VW actually owns Porsche, so in the end, it all makes sense). Fortunately, the OBD (on board diagnostics) system actually serves as a handy early-warning system to prevent running an engine that’s experiencing a problem. The intention of the check engine light is to throw errors codes to make it easier to pinpoint where the problem is, so if you see it appear, don’t immediately freak out – just take it to one of our experienced independent Porsche mechanics in Los Angeles! 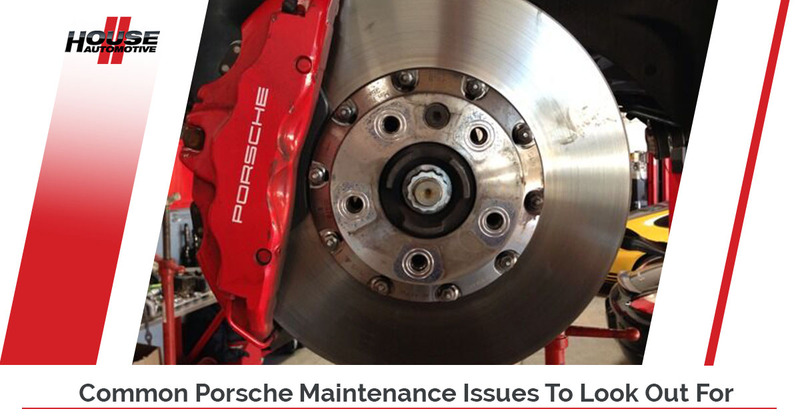 Not exclusive to the Porsche brand, a broken water pump can be a rather costly fix. The water pump is designed to pump water (gee, no wonder?) around the coolant system to prevent the engine from overheating. If an extended period of overheating does occur, the head and block of the engine can and will eventually crack – not good. So, ensure that your engine heat levels are normal by paying attention to that needle on your dashboard. If your engine temperature rises for any reason, get the water pump checked out immediately. The lifeblood of any engine, oil provides the necessary lubrication for moving parts in an internal combustion engine. Without a sufficient level of oil, your engine will literally grind and tear itself apart. Make sure to frequently change your oil every 3,000-5,000 miles, including your oil filter. This is more often than other car manufacturers, but remember, Porsches are high-performance driving machines! While your engine’s oil is absolutely essential, the air filter is also very important. For a combustion engine to work properly, there must be fuel, spark, and of course, air. A dirty air filter can really hamper the airflow to the engine and can even lead to sputtering and dying, or uneven idling. Consider replacing or regularly cleaning your Porsche air filter. Of course, our seasoned independent Porsche maintenance experts can help guide your decision. At HOUSE Automotive, our main concern is your safety while driving your Porsche. While the thrill of Porsche’s characteristic precision driving experience is incredible, there’s no point if your Porsche isn’t running correctly. So, before you’re in a position where you’re desperately searching “Porsche mechanic near me” on your smartphone, come visit our independent Porsche mechanic shop in Pasadena for regular maintenance. Thanks for “tuning” in!